I hate to start off another blog post talking about how busy I am (I mean really…how dull), so I’ll just say this – don’t let me sign up for anything else for a good long while. All of the events I’ve taken part in have been great, but my urge to retreat to my studio nest is growing stronger by the minute. Fortunately my next event happens to be a super fun one happening at one of my favorite spots in Vancouver. 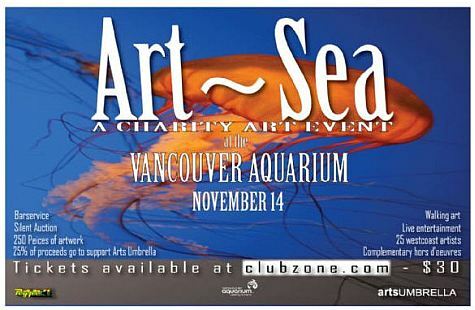 I’m super excited to be part of Art SEA 2009 with an amazing location, great company and 25% of all proceeds going to an awesome charity – Arts Umbrella. It’s going to be a blast and if you’re a local, you can grab your tickets from Club Zone now or get them at the door. But with 217 craft shows coming up over the next 2 months (OK…maybe it’s more like 8, but still!) I’m kind of missing just painting. You know, painting for the sake of painting without a holiday or particular show in mind. I miss pushing the paint around and letting one of my characters emerge. We’re getting lonely here and the gang definitely needs some fresh blood. January, you’re looking mighty fine.